What kind of door knob do I use on a closet door. You need door knobs for closet doors in a hallway, but these doors don’t necessarily need a knob on the interior, right? Closet doors are typically done in two different ways. 1 – Ball Catch Closure – Many closets have a spring loaded ball in a cylinder at the top of the door that catches into a stike to hold the door closed. If you have this type of catch, you wouldn’t need a bore hole in your door. In this case you can use a single dummy mounted to the surface of the door. 2- Spring Loaded Latch (more common) – If your closet door uses a spring loaded latch that catches into a strike on the jamb (just like any other door to the house or room) you will need to install a passage function knob or lever. They do not make a single sided working knob or lever (in residential grade) so you just use a passage set and the inside knob or lever just isn’t ever used. Multi Point locks or Patio door locks are really nice. They provide a little more security than a regular lock. Multi point means that is has different points where a bolt (similar to a deadbolt) will lock the door in place. For example there is always one in the regular spot on the side edge of the door, one can be coming out of the very top of the door and one at the bottom. Talk about security. Multi point locks also function super well and they are great as far as style goes as well. Please make sure before you order that it matches up to yours. We do not guarantee that all of them will match, so it’s best to make sure before you place your order. After you find that it does match you can choose from many back plates, and then from many levers and finishes. There are a lot of styles to help make it fit your own unique, modern, rustic or whatever other style you may have. Please call us if you need help! Otherwise, happy mix and matching! Handlesets or Entry door sets are a great way to dress up your front door. Not only are there many many designs and finishes to choose from, but there are also several types of handlesets that you can have your pick from as well. All can be nicely categorized on our site if you wish to make things a little more smooth going. There are 3 different designs to choose from such as the two piece (or sectional), the one piece (or Monolithic), or full plate (or full length). But before you choose one of the 3 designs, you get to choose the type! Double sided handlesets or also known as a grip by grip handleset, as shown in the picture above have, are a handleset that comes with the grip on both the outside and the inside of the door. This style isn’t as common as the rest, but they sure do look nice. Two point locks are great for those of you who want a little more security. They provide two locking points, the deadbolt and the handle each have a lock or keyed cylinder, just for that added or extra security. When you press down on the lever from the inside, the deadbolt and lever latch automatically unlock, it opens the door in one single action. This makes an easy exit in case of emergency. Mortise Lock Handlesets are just a little bit different than all your other standard handlesets. If you notice the pictures it looks a little bit different on the side of the door, as it has a big plate, which is a box that slides in the door. These are require special prepping, so make sure your door is prepped correctly. And finally check out the Keyless Handlesets which provide a super easy way to unlock and lock the door. No keys required! There’s always something new and exciting from Emtek. We love it. They are always bringing something fresh. There are several new things they have introduced. Each of these are available now and if you aren’t able to find them on the site yet, please call us so we can place the order by phone. They should be added to the site very soon. Art Deco Cabinet Hardware Collection. Introducing the Art Deco Knob, the Art Deco Pull, the Newport Knob, the Tribeca Pull, the Alexander Pull, and the Art Deco Square Backplate for knob as well as one for the pull. This new cabinet hardware collection of pulls and knobs are all available in oil rubbed bronze, satin nickel, polished chrome, and polished nickel finishes. Backplates are available for each knob or pull as well. This is a great new addition to all the other unique rosettes you can choose from. 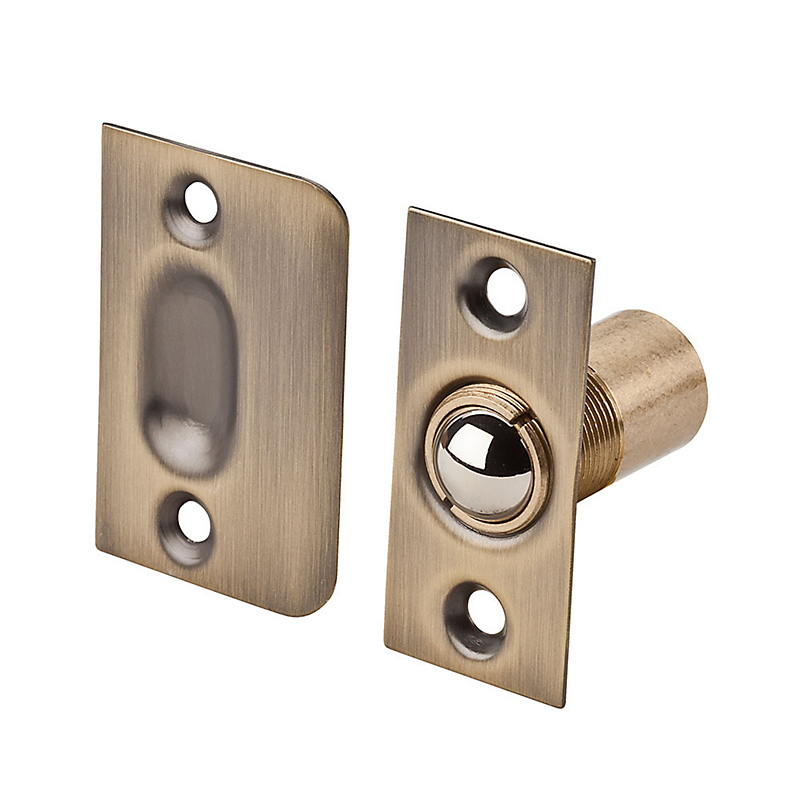 The rectangular rosette is available for any of the passage and privacy knobs/levers Emtek offers. Don’t get it confused with the Neos rosette, which is also rectangular shaped but with rounder edges. This great new rectangular rosette is an awesome sleek style that will help bring that modern design you are going for to your home. The Norwich Cabinet Hardware is now available. If you liked the Norwich Door Knob, then you’ll love the Norwich cabinet hardware! You can choose from either the 1 1/4″ or the 1 5/8″ sizes. Made from solid brass and available in 7 finishes. UL listed door sets are important for some applications (because they pass the tests for safety requirements in case of a fire), but sometimes it’s hard to find stylish door sets. Not anymore! With these Emtek UL Listed Mortise Locks all you have to do is turn the knob/lever from the inside and it will automatically open the deadbolt and latch for an easy exit. With a Grade 1 security rating and a 180 minute fire rating, you will feel comfortable installing these on any condo or apartment or any other multi unit building. Why is One Manufacturers Product More Than Another’s When The Style is Similar? A great question! I know that may be a little confusing. There are quit a few different door knobs, lever handles and other door hardware that look very similar but are from different brands and some brands may be more expensive than others. For example this Emtek Egg knob and this Sure-Loc Egg knob (shown above). They each look very similar to eachother but if you click on them the price is not so similar. It’s around a $60.00 difference. What is the reason for this? The Emtek hardware and the Sure-Loc hardware and other brands for that matter are all made differently and with different material. We are talking about Emtek vs. Sure-Loc in this case, so the Sure-Loc door hardware are made of zinc die cast and they are all hollow where the Emtek door hardware are made of solid brass material. Making the material from Emtek a little more higher in quality from the Sure-Loc. Don’t get me wrong, Sure-Loc is a great quality and can do it’s job well, but some people are a little picky when it comes to how solid their door hardware is, and that’s what Emtek is. And this is generally the case with all door hardware on the site, the higher priced hardware such as Baldwin, Emtek, Linnea, Omnia (just to name a few) are all made of solid material making it more durable and maybe more smooth function and of course the quality. It’s not always necessary to have this type of hardware in your home if you are ok with it. Other brands such as Sure-Loc, Weslock, Schlage, and Kwikset (to name a few) are great quality as well, and more simple and maybe better for fitting in a tight budget. These brands offer good hardware for a more affordable price. Other reasons that can effect the price of similar pieces of hardware could be because of the warranty coverage, the brand name reputation, product origin, distribution channels and all of the door hardware manufacturers we work with set their own pricing based on everything we said above. What Door Hardware Do I Need On Interior French Doors? It can be so confusing to know what to order for a set of french doors. And it’s true, it can be a little tricky if you aren’t familiar with all the different functions and such. French doors on the inside of your house will have a door that’s fixed and the other operable. The fixed door will need to have a latch, called a flush bolt or a more decorative one called a surface bolt (these bolts come in all kinds of shapes and sizes and finishes to match your existing door hardware), that you can unlock that will be located at the top and/or bottom of the door to keep the door shut in place. And when you unlock it, it will allow you to open the door. Depending on what you want the french doors to look like, you can choose to order a dummy function door knob/lever (these are available with any style of door knob or lever handle you decide on) so it matches the operable door. Some people decide it’s not necessary to order a dummy door knob, as it doesn’t function and is only mounted to the surface of the door, whereas others choose to order the dummy function either because they believe it looks nicer or sometimes people like it because then you do have a handle to pull it open when the flush bolt is unlocked. A good thing to note when ordering the dummy function is that some brands only ship one singe dummy door knob/lever, meaning you will only receive one for one side of the door. Look for double dummy, which will come with two for each side of the door. If you are looking for what kind of hardware to order for double closet doors, read this post. For the operable door, it’s most likely bored with a hole to fit the door knob or lever. Lots and lots of doors already come this way with standard door prep. For an interior french door you will want to order a passage or privacy function door knob or lever. A passage is a door knob that functions but has no type of lock at all, whereas the privacy will have a privacy push/turn button to lock the door knob in place for privacy. You will find privacy functions on a bathroom or bedroom door. It just depends on what type of room these french doors lead to and your preference. If you are looking to find what kind of door hardware to order for exterior french doors check out an earlier post all about that here. Have a Thicker Door and Need to Find A Handleset to Fit? Handlesets are great for any entry door. It’s secure, it’s easy to use and it’ll dress up your front door. You can choose from a wide variety of finishes that will coordinate with all the rest of your door hardware throughout your house. Not only is there a wide variety of finishes, but you also have different styles of handlesets to choose from, such as double sided, two point locks, emergency egress/interconnected handlesets, and mortise locks. If you have french doors, dummy handlesets are available for the inactive door. It’s fun to be able to pick and choose all the different styles and all the different interior door knobs and levers that can make your front door either unique, or you can match the rest of your hardware throughout your house. Make sure to order from the same brand if you want your finishes to match. Anyway, enough about all the different styles and options you can choose from, what happens if you have a thicker door than normal? Are there options for a door that’s thicker than the standard size door (up to 2″ is generally standard door thickness)? You bet there are options! Quite a few styles and designs to choose from. Which means just because your door is thick, doesn’t mean you don’t get all the options that you may get when ordering for a door that has standard thickness. The options are a little fewer as far as design goes, because not all brands will carry hardware to fit thicker doors. *NOTE: Please make sure to measure your door to be sure the door thickness before you order, because if your door is actually standard door thickness (1 3/4″ up to 2″ thick is standard) and you order for a door that’s over standard thickness like the 2 5/8″, 2 7/8″ and 3″ thick, it will not fit your door. Press down on the lever and deadbolt and lever latch retract simultaneously. You may have heard of interconnected locks before, also known as emergency egress locks. These special handlesets are designed to easily unlock the door. Basically it’s a lock where the deadbolt and knob (or lever) latch are linked with a device called and interconnect device. An interconnect device is an internal mechanism that deactivates the deadbolt lock when you turn the door knob/lever from the inside to open the door. There are a couple different styles available so be sure to verify how your existing door is prepped before you order so you can be sure it will fit correctly (to find out more information about two different types of interconnected locks click here and read the information given at the bottom of this page). It’s important, in some applications, that their locks are Fire Marshall Approved. Which basically means that occupants can exit the building easily in case of emergency. With these interconnect locks or emergency egress locks, you can easily open the door in a single action making it really convenient when exiting and that’s especially important if there were some kind of an emergency. It’s designed to open even if the door is locked! From Baldwin, Emtek, EZSet, Kwikset, Schlage and Weslock Brands, there are Residential Style Interconnect (or Emergency Egress) Locks, Or there are Interconnect Locks for a commercial applications. *NOTE: These Interconnected locks meet the requirements of most Fire Marshals, but the user may need to check with their own local authority to verify. Interconnect locks have been uses in hospitals, group homes, apartment buildings and other public access places, but you could easily use them for your own home if you wish. It does make for an easy exit. You can find a ton more information on emergency egress (interconnected) locks here. What is the CF Mechanism? Maybe you have seen a ton of great hardware already from Emtek, but have you seen the new(er) CF mechanism they came out with? Now your question might be “What in the world is that?”… It’s only something that’s awesome, something that’s genius, something you all will probably want! CF is short for ‘Concealed Fastener’. In other words this system that is oh so genius is a super sleek design with no exposed screws. I say again… you can’t see the screws! Brilliant! This makes all of their modern, stylish, unique, awesome designs of door hardware even more sleek. All of Emtek’s Brass, Stainless Steel, Bronze, Crystal and Porcelain interior passage and privacy locksets are available with the CF mechanism feature. You can see all of the door knobs and levers with the CF mechanism here. There is no handing required on any CF mechanism, not even for the levers. You don’t have to worry about if your door is a right hand or left hand with the CF mechanism. It’s also easy and simple to install. These are designed to fit standard door prep and a door thickness of 1 3/8″ to 1 3/4″, but if you have a door thickness that is up to 2 3/4″, Emtek offers special accommodations to fit it, just make sure you specify when you order and we will make sure to send you the right items. What’s also pretty cool about this new feature is that it also includes a 28 degree latch. 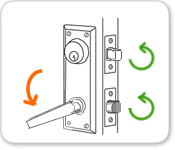 Standard latches will require you to turn the door knob or push the lever down (like the picture above shows) a lot more than it would require you to turn a door knob or lever with a 28 degree latch. You will love how smooth it operates. It’s just something more convenient to have that Emtek has offered with the cool CF mechanism! It doesn’t seem like you could go wrong with choosing the CF mechanism, does it?